Provide medical assistance to people who are marginalised either as a result of conflict, poverty or the remoteness of their homes. Improve access to healthcare for those people in the poorest, most remote regions where healthcare is scarce. Offer a bespoke approach: since every country, community and individual is different, our projects are tailored to the specific needs of a situation. Give the best to the least: our patients are some of the most marginalised and forgotten people of the world. It is a thrill to bring them the best in medical care. Enable community development: opening access to healthcare can open the door for further development of a community. In 1990, just after the collapse of the Romanian Communist regime, the television images of thousands of children living in appalling conditions in Ceausescu’s network of orphanages was shocking. This prompted an unprecedented wave of well intentioned volunteer helpers from all corners of the world across Romania’s previously inaccessible borders. Anita Roddick, founder of The Body Shop, went out to Romania to see the situation for herself. On her return, she wasted no time in putting together a ‘love team’ of plumbers, carpenters, electricians and general volunteers to refurbish three orphanages. The orphanages were situated in the village of Halaucesti, situated in the poorest, least accessible region of North-East Romania. Medical projects began in Romania in 1991, with the first care teams comprising a team of nurses led by Dr. Colin Tourle. Their presence within the orphanages helped to improve the children’s appalling living conditions and to address their medical problems. 1991 was the first year that a child did not die during the harsh Romanian winter. 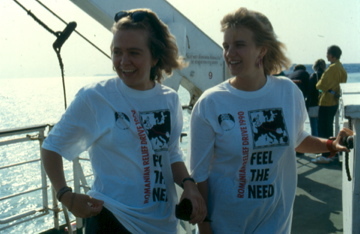 In 1992, we went to Romania to take blood samples from 2500 children (the entire orphanage population in the target region). This involved visiting 25 different orphanages. The children who tested positive for HIV were relocated to a specialist centre for centralised care. The results of the programme were published by research staff at the local University Medical School. We were faced with great need, and over time, our involvement grew deeper and deeper, culminating in the establishment of a registered charity called ‘Children on the Edge’ – now a respected international children’s charity, headed up by Rachel Bentley. Our influence grew across Eastern Europe, and we soon found ourselves developing projects in Albania and Bosnia. The Kosovo crisis in 1999 provided us with a new challenge of providing medical care not only to children, but also to their adult parents and grandparents. Consequently, we decided to form a separate, smaller organisation, with the aim of improving access to healthcare for all.